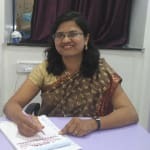 Dr. Sarika Dahiphale is an experienced Gynaecologist in Veerabhadra Nagar, Pune. Doctor has helped numerous patients in his/her 13 years of experience as a Gynaecologist. Doctor studied and completed Mbbs,, MS OBGY. You can consult Dr. Sarika Dahiphale at Elite Health Care, Datar Hospital. in Veerabhadra Nagar, Pune. Book an appointment online with Dr. Sarika Dahiphale and consult privately on Lybrate.com. Find numerous Gynaecologists in India from the comfort of your home on Lybrate.com. You will find Gynaecologists with more than 44 years of experience on Lybrate.com. Find the best Gynaecologists online in Pune. View the profile of medical specialists and their reviews from other patients to make an informed decision.